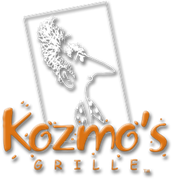 When the three Kozmo's 'amigos' (some might say 'Stooges'), Maury, Rick and Chuck, decided to open Kozmo's Grille in Downtown Massillon in 2005, they felt they wanted to bring something a little bit different (Just Different Enough?) to Western Stark County. So they went about investigating hearthstone pizza ovens. Their quest lead them to Bellingham, Washington, where they toured the Wood Stone Corporation's manufacturing facilities and learned firsthand how a hearthstone oven can add a tremendous flavor profile to pizzas, plus impart phenomenal texture and finish to pizza crust. Of course, there was just a little bit of sampling and tasting involved, and washing down of samples with adult beverages, both at Wood Stone and at Bellingham and Seattle area pizzerias that use the Wood Stone ovens. Tough work, for sure, but our intrepid trio was up to the arduous task! Having satisfied themselves that this was, indeed, the right thing to make Kozmo's 'Just Different Enough', they ponied up to invest in their Wood Stone hearthstone pizza oven, beefed up the floor to bear the weight of their new acquisition, knocked out a window to get it in the building, and the rest is history! Next, they again unselfishly forced themselves to cook and eat countless pizza recipes looking for the 'gourmet' pizzas that they were searching for. Shortly, they had their recipes in hand. "But wait, "you ask, "what about the dough?" Yes, what about the dough! To their good fortune, one of Kozmo's chefs had some experience with upscale pizzas and offered a few different dough possibilities. Again, after bravely sampling a bunch of possible crusts, they settled on the recipe that still is being used at Kozmo's today. Our crust is basically in the style of Neapolitan pizzas, toward the 'thin' side, but not too thin, nor too crispy, nor too mushy, and with a great texture and 'chew'. hearthstone oven really has made Kozmo's pizzas famous. And not just your ‘normal’ pizza! So how do we know Kozmo’s pizzas are delicious? Well, most importantly, our customers tell us, and they keep coming back for more. But beyond that, Kozmo's pizzas won the Judges' Award the first two years at the Massillon Pizza Wars, have been featured in 'About Magazine' as one of the 12 'Must Eat' food dishes in Stark County, and placed in the Top 10 in About Magazine's Pizza Wars in 2017! So we invite you to come to Kozmo's Grille and try one of our gourmet, hearthstone-baked pizzas. Seriously, you're gonna LOVE it!